Our Olympic Standard Trampolines have a more responsive and higher bounce than any other backyard trampoline. They’re awesome to have for those who are budding trampolinists or families who want to have a much more sturdy, bouncy and long-lasting trampoline! Why do they have the biggest bounce? The yellow 2 string gymnastic / professional mat is made with terylene string, woven on a loom, then painted for UV protection wear & tear etc. This type of mat has a lot less air-resistance than the black polymesh material which =’s a bigger, higher bounce. 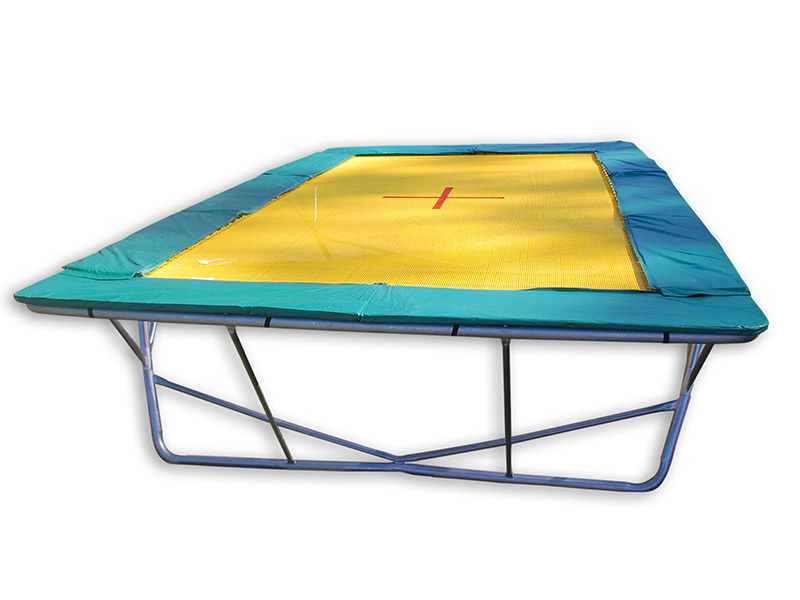 This type of mat and trampolines are used in gyms, clubs and competitions. The frame is also Aussie made galvanised steel tube 2.3 mm thick, and 50mm diameter. If you have trampoline or gymnastic skills an Olympic Standard Trampoline would be perfect for you to show off your tucks, twists and jumps. So if you have a competitive edge, or just want a long lasting backyard trampoline why not ask us about our Olympic Standard Trampolines?